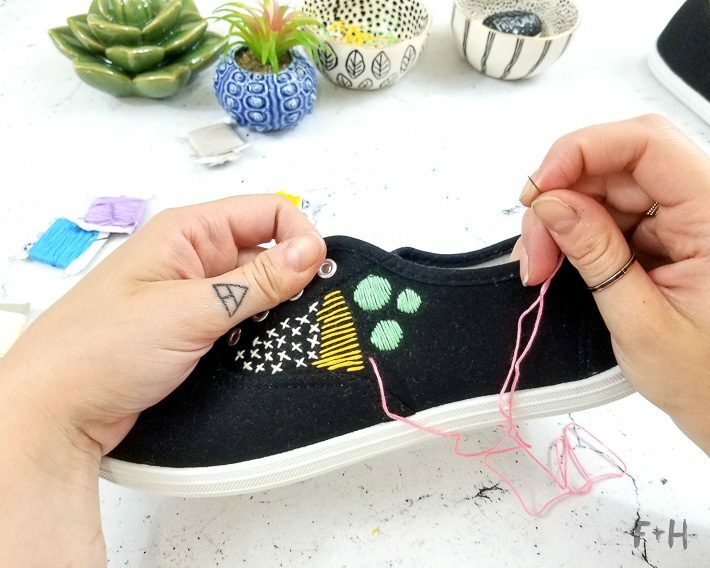 Hey fam, are you a fan of all things embroidery and cross-stitch? I am! 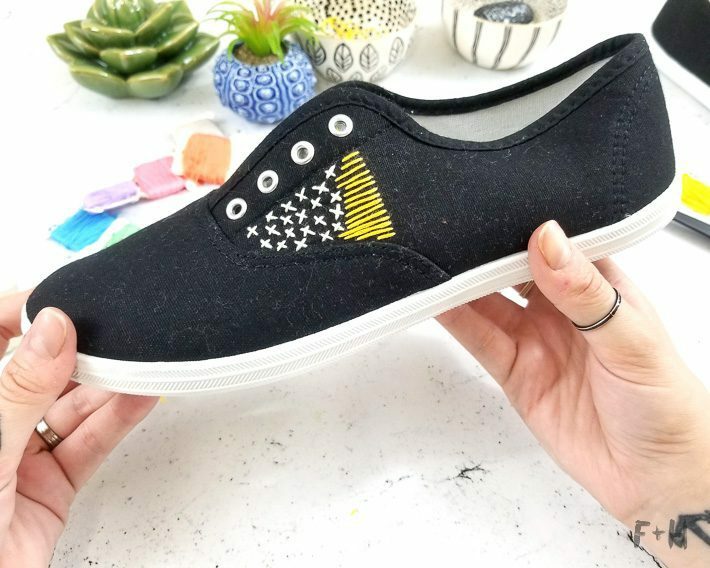 Years ago I started doing needlecraft and have recently re-discovered my love of it (like this Black & White Embroidered Photo Art!) 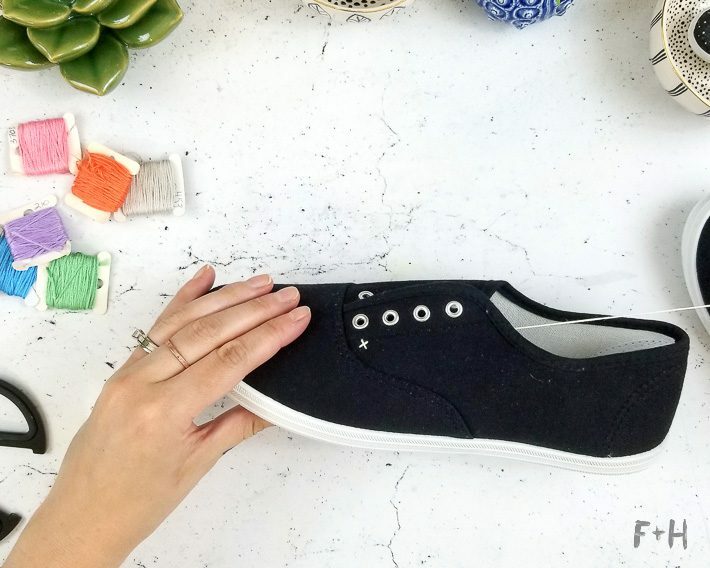 I also love wearing canvas shoes in the summertime. 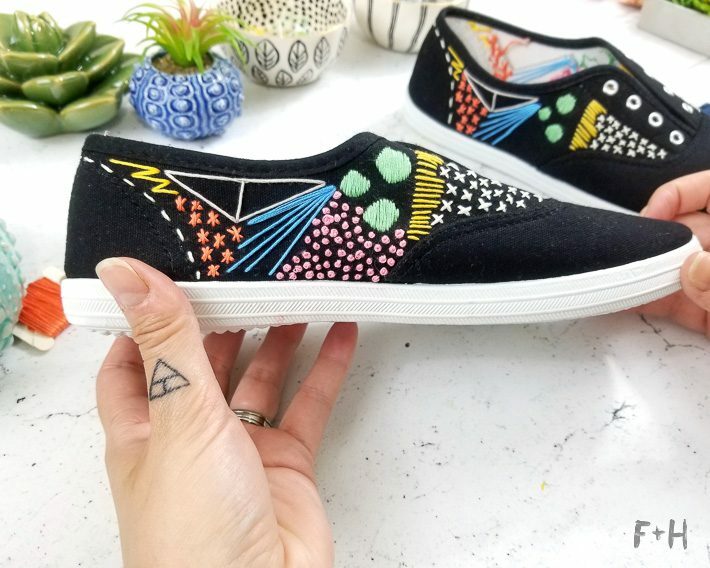 It occurred to me one day that I could spruce up a pair of cheap plain canvas sneakers with some embroidery. 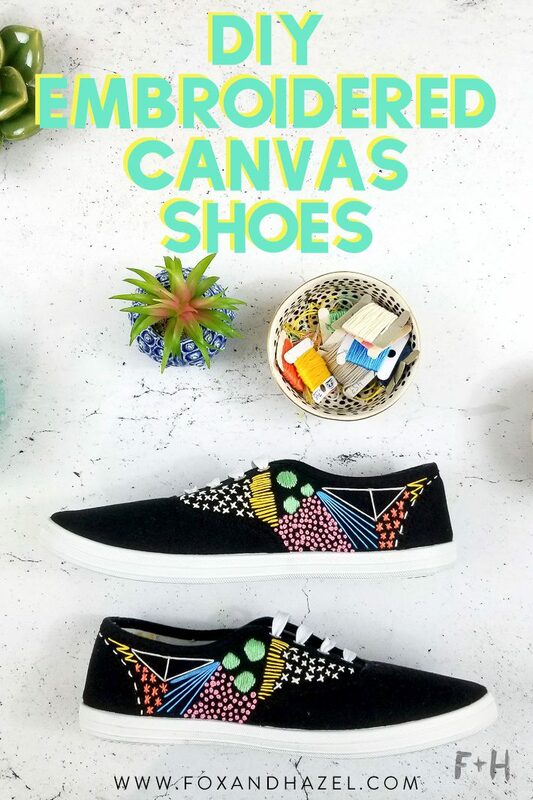 So let’s jump into how to make these embroidered canvas shoes! 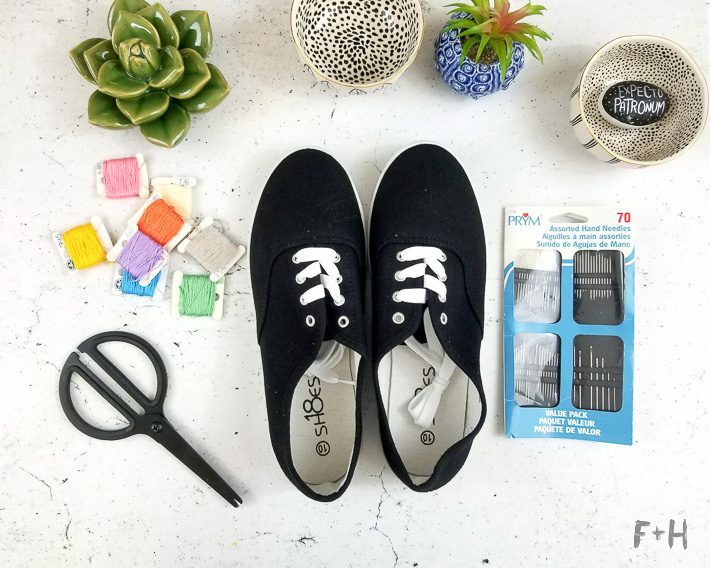 First, take the laces out of your canvas shoes – we don’t need those in the way. 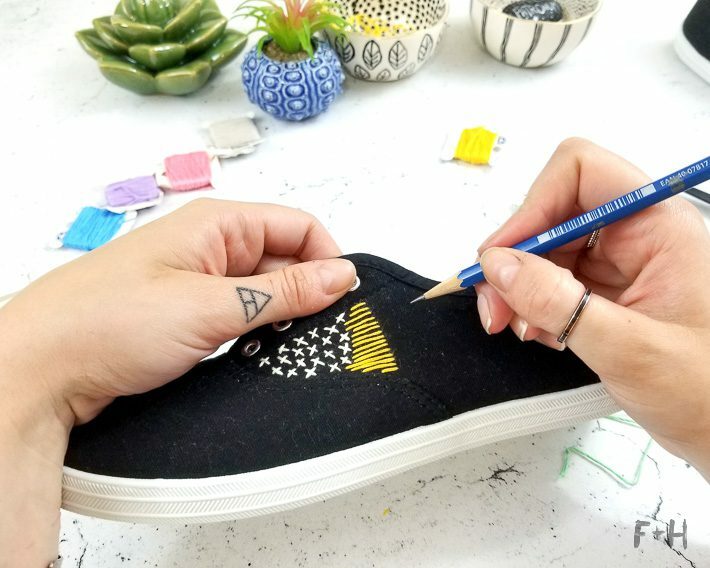 Then choose 5-7 embroidery colors to use on your shoes. I chose brighter colors so they would stand out more against the black canvas. 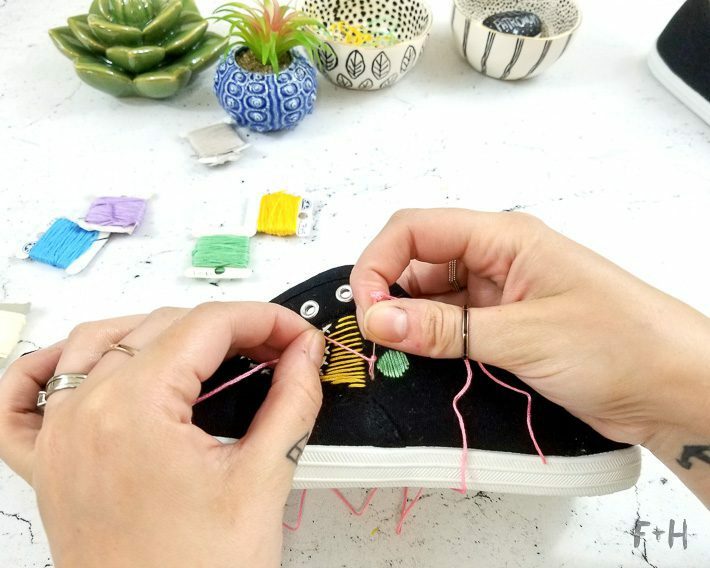 Now, I’ll be honest in that the following steps are fairly self-explanatory, so I won’t be going into a ton of detail on embroidery on how to do these! I’m not an embroidery expert, so I suggest looking up any stitches you aren’t familiar with. 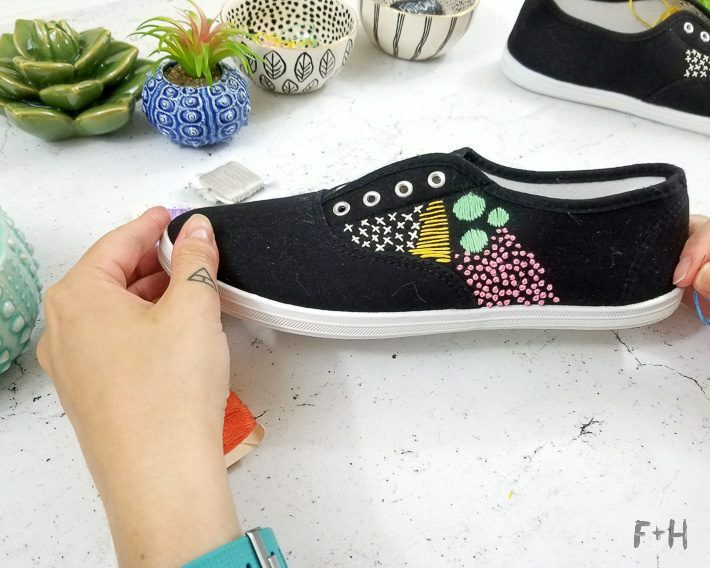 Start with a repeating pattern you like, in whichever color you choose, and start that on the front of the shoe where the lace holes start. I went with a cross stitch in white to start! 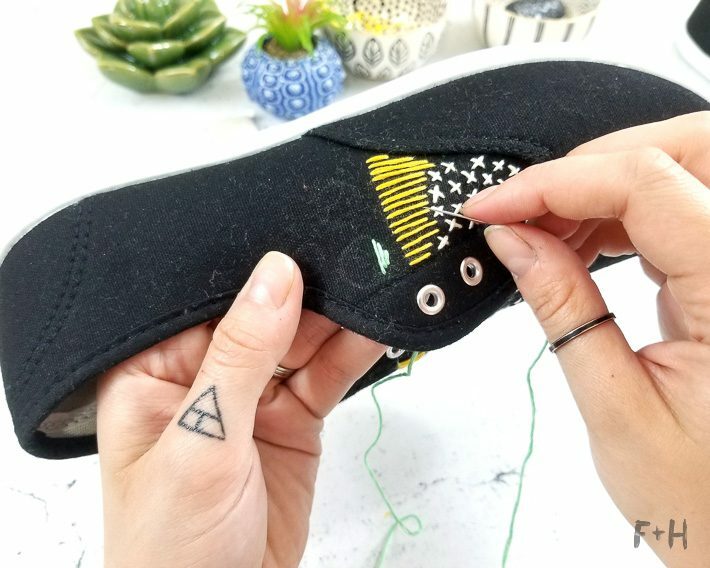 The best way to make the stitches consistent around your shoes is to do one pattern, then repeat it immediately on the other side of your shoe. This helps everything stay consistent. 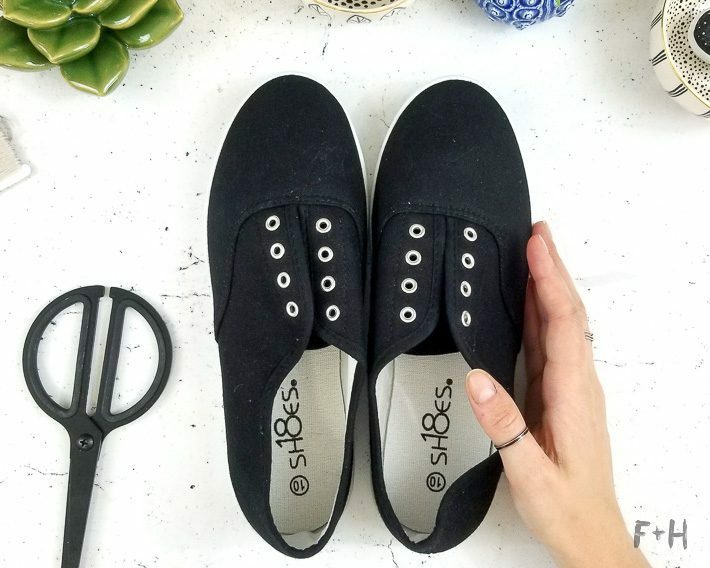 Be sure to tie off your threads with a knot inside the shoe so nothing comes loose! 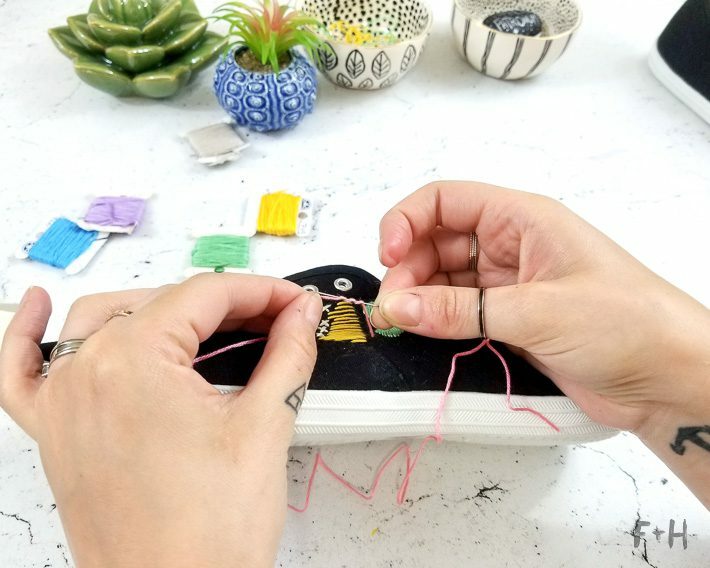 Next, you can do a straight stitch to create some lines. 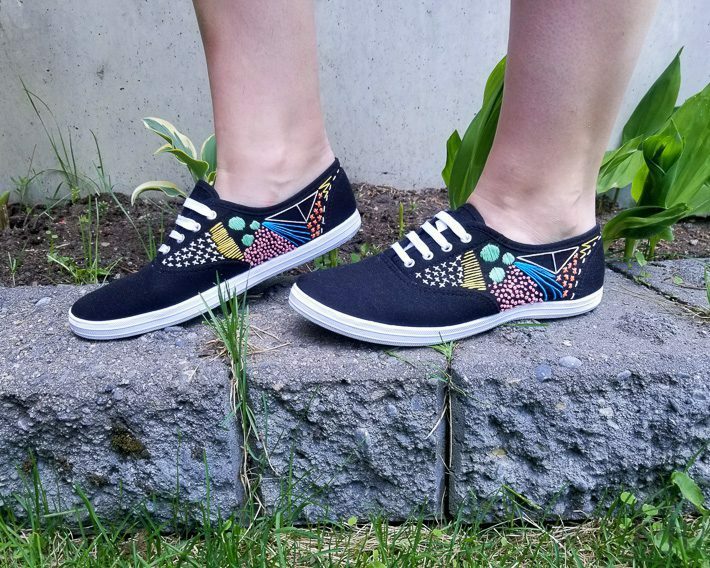 You basically want to create different shapes and patterns around the shoes to give them a graphic feel. 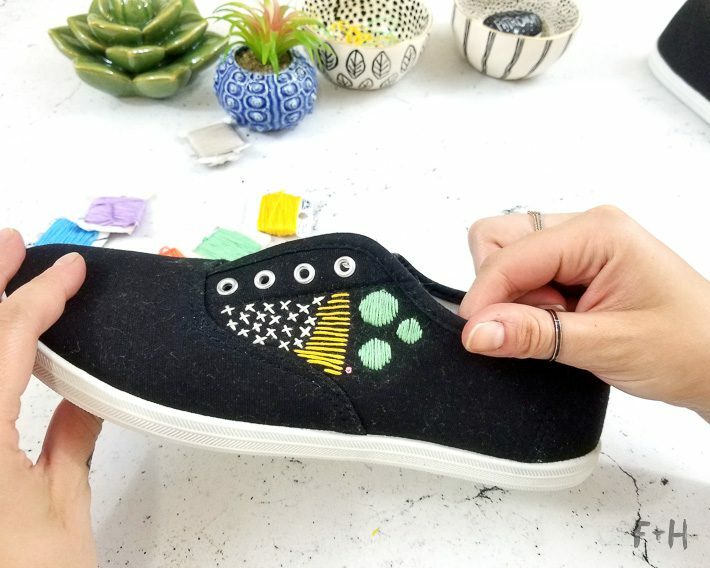 If you want to do some shapes on your embroidered canvas shoes, like these circles, I suggest drawing them in pencil first. Here I drew on the circles in pencil first and then used a satin stitch to fill them in. 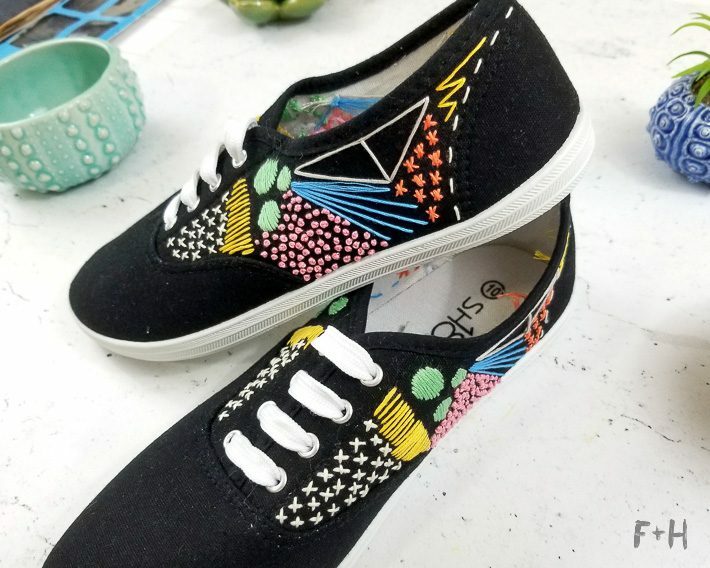 Just keep working your way around the shoes and adding different shapes/patterns in different colors. 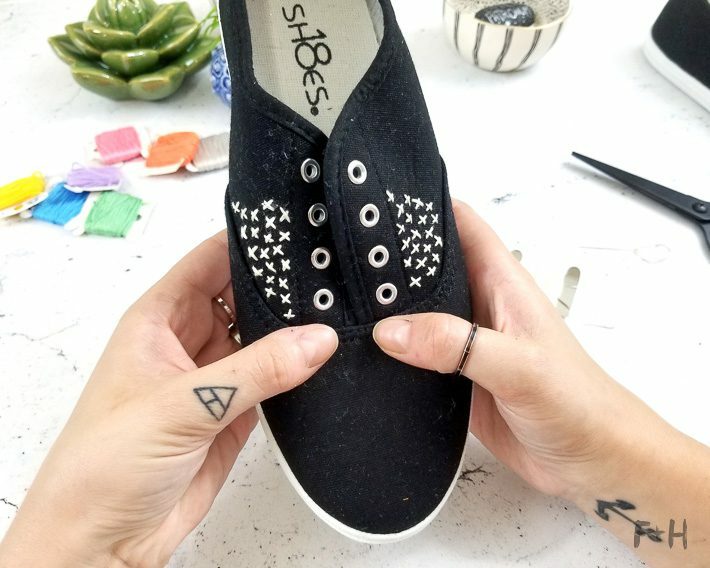 You can make them as detailed or as broad as you like! 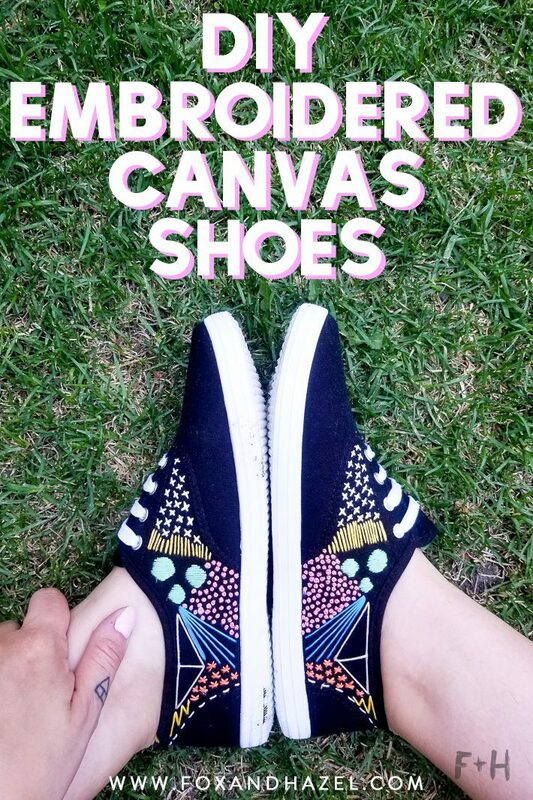 I personally love how my embroidered canvas shoes turned out! Here they are in the wild! I definitely employed my husband to be my photographer for these photos. He’s a good sport that way! 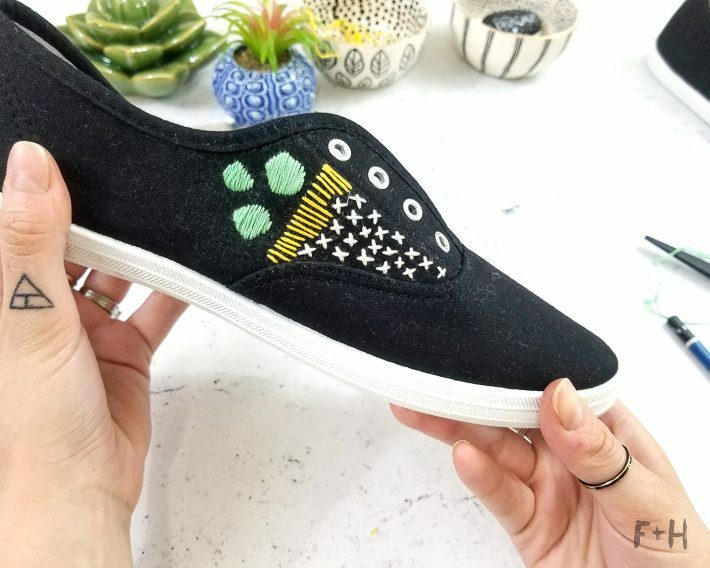 Let me know in the comments if you want to see more embroidery projects! If you loved this project, you can spread the love in one of these ways! Oh my, this is so pretty! I’d surely love to try this. 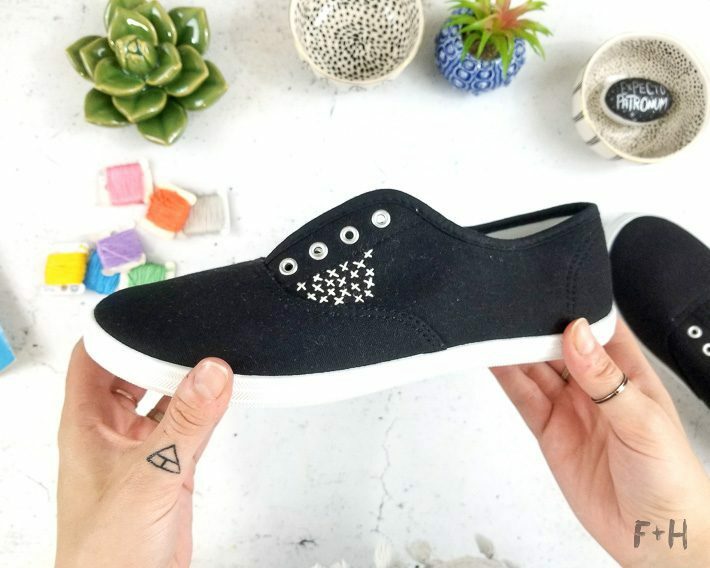 All I need now is find a sneaker to try this project.